To keep it simple, Thermal Imaging is the process of viewing and recording actual surface temperatures, signatures, and anomalies observed at surfaces such as walls, ceilings, floors, pipes, ducts, etc. Think of it as a thermometer with a television attached. Instead of mercury rising through the marks, the temperature is translated into a visual image. Using a high resolution thermal imager (or camera), we can observe and interpret surface temperatures to help determine what is or may be occurring in areas we can't readily view without destructive evaluations. All objects emit energy in the form of heat. Thermal imaging allows us to 'see' this energy and interpret our findings or the anomalies observed. Simply put... No. What we can see are the temperature differences that transfer through or occur at the surface of an object. Air movement, evaporation, moisture, heat transfer, and more all have an observable effect on surface temperatures. These create a temperature difference that our camera 'sees' and creates an image of the thermal signatures. Although our service sometimes appears to be, it is not x-ray vision. 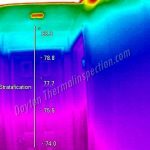 What are your fees / rates / prices for thermal inspections? Our rates vary depending on each unique application, total services requested, and our client’s individual needs. Please contact us with as much information about the property or service requested as possible. We will be happy to discuss your options and questions under no obligation. 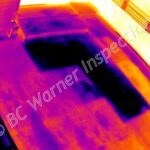 Why Choose BC Warner Inspections & Thermal Imaging Services? 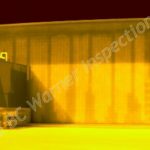 I have devoted years of time and investment in quality training and equipment to provide our clients a truly unbiased and experienced infrared inspection service. BC Warner Inspections does not perform repairs, so our service remains truly unbiased and dedicated to your best interest and trust. My knowledge and experience in infrared inspections is surpassed by few. 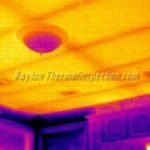 In fact, as the Educational Director for the National Association of Commercial Building Inspectors & Thermographers™, I find myself answering questions and providing technical support to many local and regional infrared companies, as well as to inspectors across the United States and Canada who actively seek advice from an experienced thermographer. Infrared technology and training varies dramatically in quality, specifications, and of course costs. Many providers, contractors, and individual inspectors unfortunately choose to enter this profession as cheaply as possible with little to no training and grossly inadequate equipment. 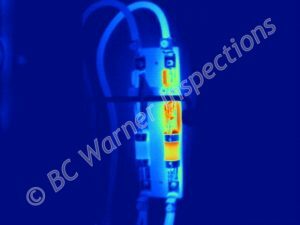 When accuracy, quality, and experience matters in such an important application as an Infrared electrical inspection, BC Warner Inspections & Thermal Imaging Services is the right choice for your facility. I encourage you to choose wisely and compare credentials, experience, and sample reports. How Does an Infrared Electrical Inspection Work? When failing or loose electrical components are present, they create heat. If arcing conditions are present or enough heat has been generated, electrical concerns can be identified visually without assistance from special equipment. However, once visible indications of an issue are present, it is often too late to perform a planned downtime repair. Infrared thermal imaging inspections of electrical equipment can detect these hazardous conditions before they become visible to the naked eye and result in unplanned failures... or worse, an impending injury or fire. Methodical inspections are performed of all electrical components within a facility or building. The infrared inspection is conducted following NFPA 70E safety guidelines, and documents any thermal exceptions in electrical equipment that may be encountered. Careful calculations and interpretation of the recorded thermal data can determine how severe the risk or electrical thermal exception is. A written report is provided to the client, documenting the observations with recorded images, important inspection data, and repair priority status. This assists electrical personnel in determining if immediate repair is needed, if the item can be fixed at the next planned maintenance interval, or if the component needs routine monitoring for changing conditions. The reports can then be filed and referred to in future infrared inspections for system condition monitoring purposes. How Often Should an Electrical Infrared Inspection Be Conducted? This is contingent on a number of factors. More and more insurance providers are encouraging their insured to have an infrared inspection performed of all their facility electrical systems because they understand risk reduction benefits. Depending on requirements or facility type, insurance providers are recommending an infrared electrical inspection be performed every 1-3 years. As part of the commissioning process, an infrared inspection is performed on new construction electrical systems shortly after installation which establishes parameters to base future surveys on, and determine if any initial concerns are present. Do You Need to Remove Access Covers for the Infrared Electrical Inspection? Most of the time the answer is YES. Unless a specialized optical device called an "infrared window" (also referred to as a viewport) has been installed in the electrical equipment, which permits infrared inspection without removing the deadfront or access cover, then the covers will need removed. While infrared is a non-contact inspection method, it does require line-of-sight to the subject. Panel covers are safely opened and removed by a qualified electrical assistant. Many facilities have qualified maintenance personnel on hand to perform this task. When facilities do not have such personnel, a qualified assistant meeting NFPA 70E guidelines is brought in to assist during the inspection process. I am buying a brand new house. 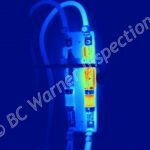 Why do I need a thermal inspection? Even new construction has defects. It is of great importance to have a thermal inspection performed since many mistakenly expect all systems to be installed properly and functioning as intended. Quite the opposite can occur unfortunately. I have observed active roof leaks, misaligned and damaged framing, and even missing insulation. 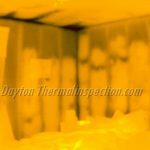 Once the drywall is up, it’s impossible to ‘see’ these defects without the assistance of thermal imaging. Often the builders are just as concerned to discover the carelessness of their sub-contractors. How can Thermal Imaging help with my commercial property? Thermal imaging can help identify numerous issues that can be prevalent in both commercial and residential properties. From roof and moisture scans, to electrical and insulation scans, these issues are very important to help you understand the overall condition. Traditional visual inspections can’t come close to seeing what we can see. Thermal imaging can even help contractors to identify troublesome issues and find hidden systems like buried radiant heating systems and plumbing in walls. The remarkable view from an infrared camera allows us to see and compare the relative temperature of an object or surface area to that of its surroundings. These comparisons can help identify otherwise invisible problems and concerns which can be caused by issues occurring below the surface of a floor, behind a wall, or above a ceiling. The images seen by the camera can reveal problems with moisture, electrical, and HVAC systems, as well as problems with insulation, foundation, framing, plumbing, and more. Combining Infrared Thermal Inspections with traditional inspection methods provides our clients the very best, state of the art service available. Drop us a line today for a free quote on your infrared inspection! "WOW!!! Now this is what I call a report! Needless to say, I'm impressed. It's going to take me some time to read this thoroughly and digest it. I noticed on your site that you do work all over the area. I'm going to pass your name along to some friends of mine." "It was pleasure to have met you and have the opportunity to work with you. I would like to thank you for the inspection report. This is the level of professionalism that I was expecting, and I thank you for delivering it." "We just wanted to say thank you again for all of your help! And for a very fast turnaround time for the report. ​We are currently planning to fix all of the urgent repairs and hope to be up and running safely again asap! Thanks for your help - we appreciate it! I'm sure we'll be back if we ever need another inspection and we will continue to send referrals your way."